I just returned from a week-long studio intensive workshop at Shakerag workshops. I attended a class taught by two fabulous textile designers, Jane Sisco and Clay McLaurin, called "Look, Play, Design." 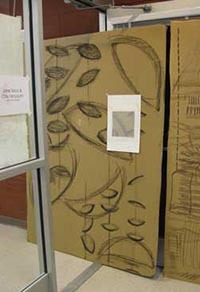 The focus was on seeking and finding a source from which to create designs through the use of various abstraction techniques. The course was based on studies from the Rhode Island School of Design (RISD) textile design program. One of the first techniques was to use a viewfinder (a small, framed window) to isolate and focus in on a portion of a larger composition. It's interesting to see how your perception shifts when you hone in on a small distilled area. Have you used a viewfinder for your work? My friend, Joanie, took the photography workshop. Her first day began with this poem by William Stafford. wherever you go right now? Are you waiting for time to show you some better thoughts?